Assistant Director, Sarah Partos, hams it up with “Bob” the skeleton. 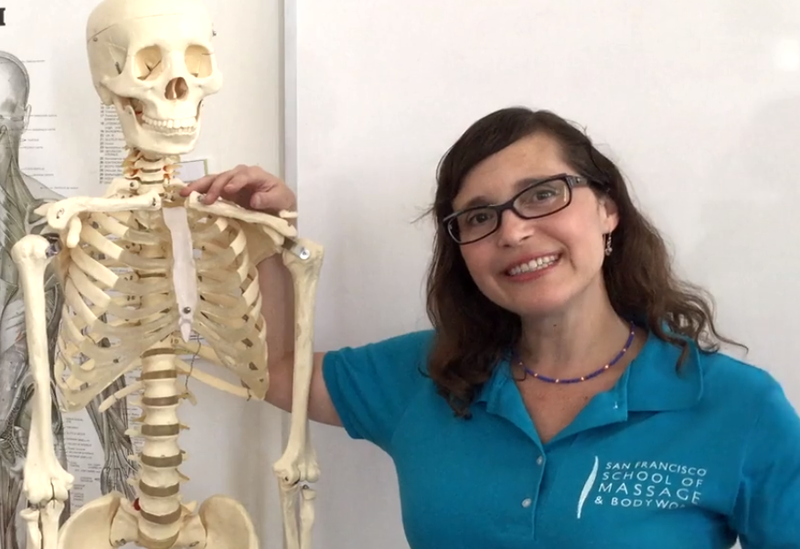 “I had thought about attending massage school for a long time before I finally took action and visited the San Francisco School of Massage & Bodywork for a tour. After visiting the school I was interested in enrolling, but decided auditing a class would be the best way to determine whether it was really a good fit. I felt a bit intimidated by the idea of massaging someone larger than me. I’m only 5’2” so I decided to pair with another student, Craig, who was around 6’ tall. I figured, if I could handle working with someone that much bigger than me, I wouldn’t have any problems with the rest of the program. As I expected the massage was challenging, but I enjoyed the whole experience much more than I anticipated, so I signed up for the Massage Therapist program! Thanks for sharing, Sarah! We’re all so glad you decided to become a permanent fixture.